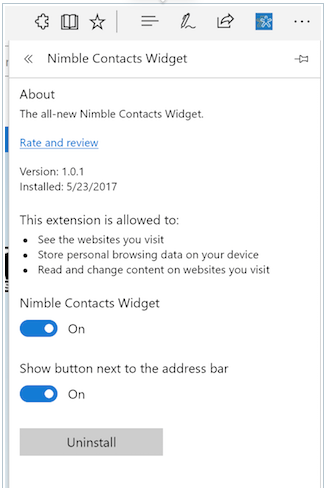 Learn how to use the Nimble Contacts extension in the Microsoft Edge browser. The Nimble Smart Contacts App allows you to see insights on all of your contacts instantly, anywhere you work. It’s available to use Nimble on top of any existing website or web application you use at your company. It is now available for Microsoft Edge for Windows 10 machines via the Microsoft Store. What does the Nimble Smart Contacts App let me do? See the "Live Profile" for any person or company - this is a record we automatically build for you, complete with the company, location, title, phone number, CEO, revenue, and social insights. All available without needing to create a contact record in Nimble. View a Nimble Contact Record from any website to create tasks, view correspondences, or do anything that you might want to do, all without having to open Nimble in a separate tab. Access all the functions of Nimble while you work on any website, app, or in your Gmail or Outlook inbox. After you install the widget, follow the instructions to complete the process. Be sure to mark "Show button next to the address bar" as "on" to easily access Nimble wherever you browse on the web. How do I add a contact profile from anywhere I work? 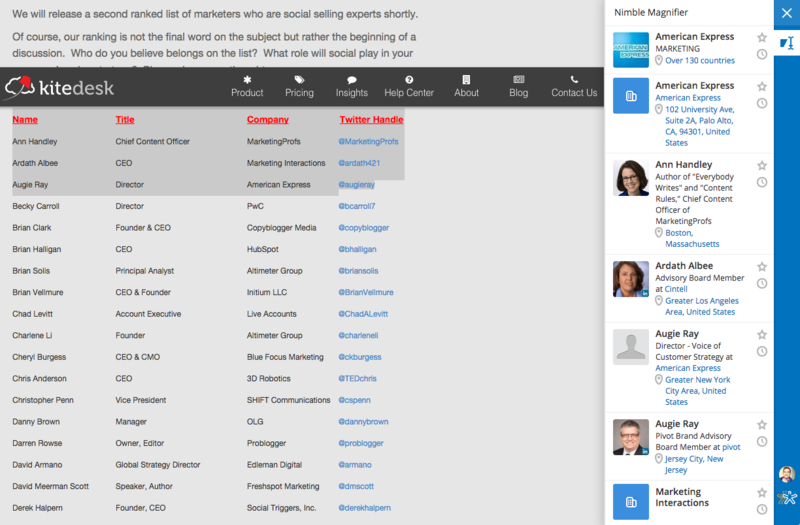 The Nimble Smart Contacts App is enhanced to work on Twitter, Facebook, AngelList, CrunchBase, Google+, HootSuite, Salesforce, Foursquare, Intercom.io, and any other website or app. For a quick lookup, open the app and highlight any piece of text or hover over any URL and Nimble will perform a lookup for that contact or company. 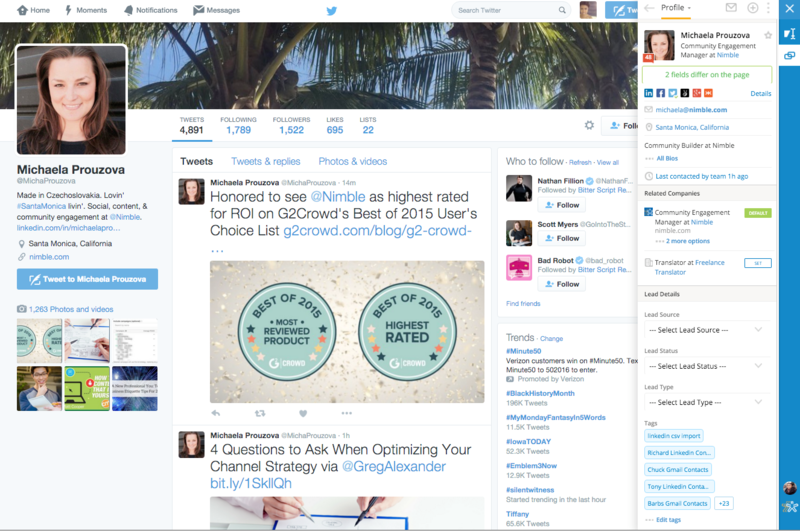 For this example, we are going to use Twitter to add a profile. Select the Nimble button on the Edge toolbar and Nimble will automatically show that contact's "Live Profile" or bring up their existing contact/company record. Go to a profile on Facebook, and open the widget. If a contact exists in Nimble, we will show you the data fields that differ. 2. If Nimble detects different job titles, location, or companies, you will see an option to "update data fields" with the simple click of a button. Not on a profile page? You can add any contact by highlighting text with the widget open in "Magnifier" mode. Open the app and hover over a contact's email (in Gmail), their Twitter, or Facebook profile, or highlight their name to look up their record. After a moment, the widget overlay will appear, and we will display their "Live Profile" or their existing contact record. Hover over a contact name link (Facebook, Twitter profile hyperlinks) or select (highlight) contact information to find matches in Nimble or import contacts to your account. 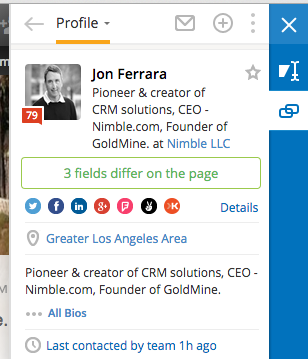 Simply open the Nimble Contacts extension while visiting a website URL and Nimble will display a live profile with insights such as: location, title, phone number, CEO, revenue, founding date, industry, company keywords, and # of employees.